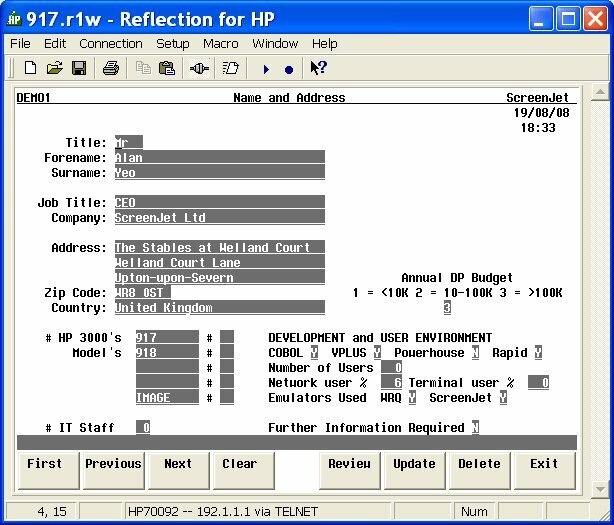 ScreenJet has developed EZV Designer to enable the user to maintain their HP3000 screens once they have been migrated to EZV. Designer replicates the functions of Formspec to enable HPe3000 developers to work easily with the new application and XML format. The ScreenJet EZV VPlus conversion tool kit extracts the proprietary screen information from an HPe3000 VPlus Formsfile and delivers it as ready-made XML screen definitions in an open format, that is both standards compliant and readable. EZV Designer maintains the screen definitions in the XML file. The ScreenJet EZV VPlus conversion tool kit extracts the proprietary screen information from an HPe3000 VPlus formfile and delivers it as ready-made XML screen definitions in an open format, that is both standards compliant and readable. In addition to the conversion toolkit there is a replacement VPlus API. This allows applications to retain their existing VPlus calls, and at runtime the API resolves these calls and makes the appropriate calls using the new XML defined screens. This combined ScreenJet solutions means that there are no coding changes required to your existing code. EZV is the third generation VPlus conversion/migration product from ScreenJet ltd. It is based on the original ScreenJet product - which was the first successful VPlus to GUI, host-based, thin client product for the HPe3000 - and the ACUCOBOL-GT thin client technology solution developed for the AcuCorp (Microfocus) ExtendTM products. For rapid, risk-free migrations, a replacement user interface has been created that functions identically to the original VPlus interface and runs on terminals or terminal emulators. As a result, no user re-training costs are required. Once converted the screens are in an open, standards compliant, XML format, which can be maintained by suitable screen maintenance programs, or even edited by hand using your favorite editor. For those familiar to developing on the HPe3000 with VPlus, no new language skills are required when porting to EZV. Automated conversion of the screens allows you to quickly start testing migrated applications, and also allows you to repeat the process if conversion and continued development on the HPe3000 have to be performed in parallel. The Terminal/Emulator User Interface model delivers all the data centre control and ease of management that characterized the HPe3000. The ScreenJet EZV VPls conversion solution and API is the only solution available that allows the migration to be tested whilst the application remains on the HPe3000, thus reducing risk, and allowing migration testing to be accomplished in a phased, rather than big bang, approach. Whilst the EZV user interface remains identical for the end user, the underlying changes mean that in the future upgrading all or part of the user interface to a full Graphical User Interface (GUI) becomes achievable. Please email Sales for more details. The ScreenJet EZV conversion software has two components that run on the HPe3000. Firstly, there is an extract program that reads the VPlus formfile to obtain all the information about the formfile, the layout of the forms, and the attributes of every function key, save field, ARB definition, screen, and their individual labels and fields, including all processing specification code. This information is stored in a database on the HPe3000 from which the XML formfile equivalent is generated. This database provides the flexibility that enables the co-existence of ongoing development work in VPlus on the HPe3000 whilst the conversion project is underway. Individual forms can be re-extracted from the formfile as required, or new ones extracted and added into the database. The second part of the conversion is a generation phase. You select a formfile and the generation process creates the appropriate XML file. These files can then be simply transferred to the target server, or utilised directly on the HPe3000. What types of VPlus formfile can be converted? The ScreenJet EZV extract process can work on both VFORM and VFAST files, however at this time processing specification code can only be extracted from a VFORM file. So if you have lost the source for a VPlus formfile, the conversion tool can still do most of the work for you. What doesn't the conversion handle? All VPLUS data types, functions and calls are converted and supported. There are some attributes of a formfile that the ScreenJet tool doesn't convert or the EZV API does not process, as they are redundant or no device other than an old HP2645 terminal can handle. For instance, CONFIG Phase Statements are only actioned by VPlus if it detects that the terminal is an HP2645; otherwise it ignores them. As we suspect that the number of 2645 Terminals still in use for applications can probably be counted on one hand, we have chosen to not implement this functionality. It is also highly unlikely that any modern display device will be equipped with the lights, internal tape drives and paper tape readers that the config statements are used to control. The EZV API is written in C and can be made available for most platforms that support Telnet or NS/VT. For further information, please contact: Alan Yeo.